Washington (CNN) -- The U.S. military is investigating whether American taxpayer dollars from a more than $2 billion contract are being used to pay off Afghan insurgents in return for not attacking contractors. 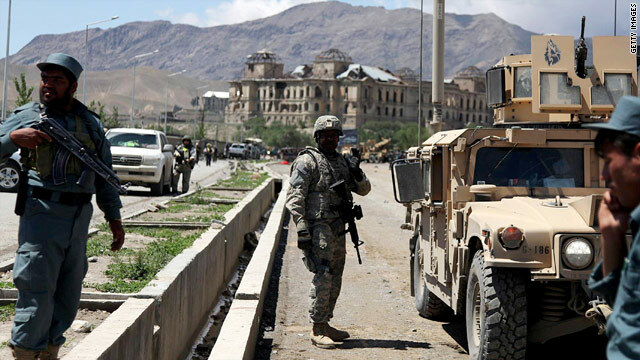 The issue at hand is whether contractors working for the U.S. government in Afghanistan are paying protection money to local security companies, which in turn give the money to Afghan insurgents so they will not attack the contractors. The money allegedly ending up in Taliban or warlord hands is from a number of Pentagon contracts, according to a U.S. military official not authorized to speak publicly about the investigation. In order for trucks to pass safely through certain areas in Afghanistan carrying everything from ammunition to food for the U.S. military, the contracted trucking companies pay the local security companies responsible for their safe passage. The security companies allegedly have ties to the Taliban or warlords who control the roads in a specific region of the country, according to the official. The official said there is a tight lock on releasing details of the case because investigators are still following the actions of some of the security firms. The official would not say how much money has been paid or what part of the country this is occurring. Army Criminal Investigation Division (CID) spokesman Christopher Grey said the CID does have an investigation on "host-nation trucking" underway but he would not discuss details. The Afghan Host Nation Trucking contract is split among eight companies to provide ground transportation in Afghanistan for over 90 percent of Department of Defense (DoD) goods and materiel, including food, water, fuel, equipment, and ammunition, according to a congressional subcommittee. Since mid-2009, contractors have completed over 40,000 missions, subcommittee statistics show. Most goods and materiel, including U.S. military vehicles, are shipped through Pakistan to Bagram Airfield and then distributed to several hundred U.S. camps, airfields, forward operating bases, and firebases. A separate congressional investigation to be released Tuesday raises similar questions about a $2.16 billion trucking contract to provide transportation for a majority of U.S. goods and materiel in Afghanistan. "It would mean that the United States is unintentionally engaged in a vast protection racket and, as such, may be indirectly funding the very insurgents we are trying to fight," said U.S. Rep. John F. Tierney, D-Massachusetts, chairman of the House Subcommittee on National Security and Foreign Affairs, said in December. The subcommittee is holding a hearing on the issue on Tuesday in Washington.